It’s like the little museum that could. The Minnesota Museum of American Art, fondly referred to as “The M,” will reopen its doors on Sunday, December 2 after nearly a year of construction. It will remain in the same location of St. Paul’s historic Pioneer Endicott buildings, but the front entrance will now be located at 350 Robert Street North. "It’s fabulous," said Executive Director Kristin Makholm when reached by phone. "This is a long time coming and it’s just very satisfying to have a day and a weekend and a plan to bring this museum back to life in a substantial way." Festivities on opening day will include ribbon-cutting with city and state leaders, art-making, performances, and curator led-tours. There will also be new exhibitions to see. “100 Years and Counting: Selections from the Minnesota Museum of American Art” will kick off the opening, as will NY-based artist Sheila Pepe’s crocheted shapes which reference architect Cass Gilbert, who designed the Endicott building. Duluth-based artist David Bowen shows real-time wave videos in the new streetscape window gallery facing Robert Street. The reopening of the M also includes the much-anticipated new Sifo Center for Creativity, which will offer studio classes for adults including ceramic Mesoamerican flute-making, Hmong embroidery, oil painting and drawing. Classes will be taught by local artists such as Leslie Barlow, Maggie Thompson, Xilam Balam, and many others. "I’m really looking forward to our center for creativity," said Makholm. "Art education, art making and learning are in the DNA of this museum – it got lost in the shuffle, we are bringing that back." The once-broke museum has made major comebacks, raising capital and also increasing its operations and hiring more staff. 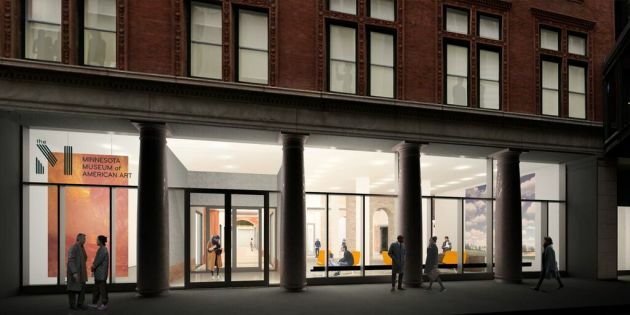 One such win happened this past May, when the M received a $325,000 grant from the Henry Luce Foundation, which it is using to support the installation of its permanent collection at its new 36,000-square-foot facility at the Pioneer Endicott building. It also received a $33,000 grant form the National Endowment of the Arts (NEA) to support the exhibition “Brad Kahlhamer: A Nation of One,” which is ripe with symbolism from both American Indian and vernacular cultures. The M has been something of a nomad, inhabiting 13 spaces since its inception in 1894 when it lived for a year at the Metropolitian Hotel. "Some of the older folks remember us in a mansion on Summit in St. Paul," mused Makholm, referring to its time at 476 Summit Ave. from 1939-1964. The museum continued to be on the move after that time. It relocated to the Pioneer-Endicott building in 2013, reopening after being closed for three years. Director Kristin Makholm came onboard in 2009, bringing life back to the formerly bankrupt organization. She said that this new grand reopening also marks a new era of permanency. "This museum has had so many different homes and lives – like a cat, 'the 9 lives of the M' – but this is it," said Makholm. "This is the one that will finaly keep us going into the future. No one will have to ask again what our future is, what our name is, because we have a substantial plan moving forward."